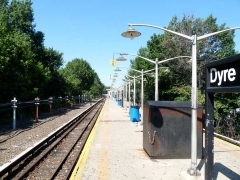 I was looking through some photos in my IPhoto collection (I rarely discard any photos from Forgotten NY missions) from the summer of 2011, one of the relatively few times I have explored Eastchester, when I noticed several interesting items clustered around the IRT #5 Dyre Avenue station, the terminal of what is called the Dyre Avenue line on the IRT. Like the A train to the Rockaways, this section of the subways was purchased from a “legitimate” railroad, the NY, Westchester and Boston, a former passenger railway first constructed in the 1910s that was supposed to enable Westchester commuters a faster ride into Manhattan; the line terminated in the south Bronx, where riders would transfer to the IRT subway. Eventually, the builders wanted to extend it northeast into New England and Boston, hence the name. The line was never a financial success, and shut down in 1937. The Transit Authority, as the MTA was then called, purchased the tracks and converted it into an open cut and elevated shuttle line; the tracks were later given switches to the White Plains Road #2 line. For many years, though, until the days of the MetroCard, it was a true shuttle and passengers paid the conductors on board or handed them transfer tickets. 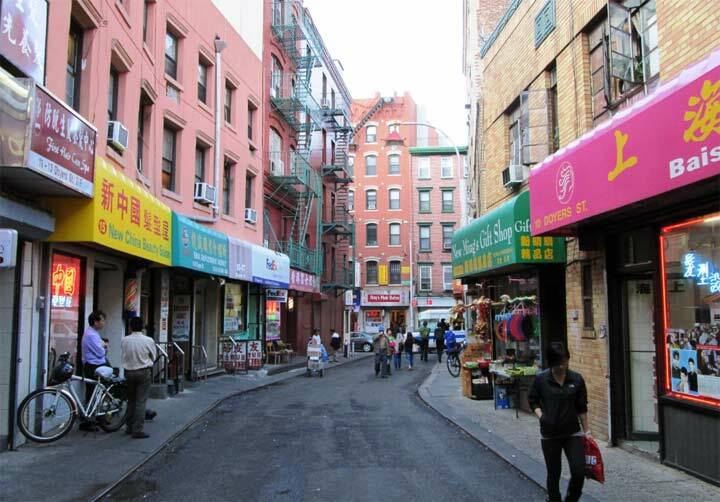 I walked the streets abutting the line a few years ago and reported on it for FNY. 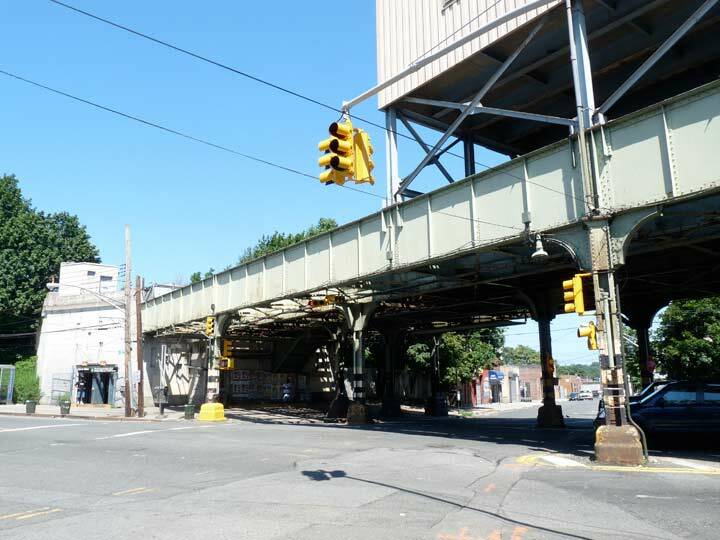 At Dyre Avenue the line is bridged over the intersection of Dyre Avenue and Light Street. 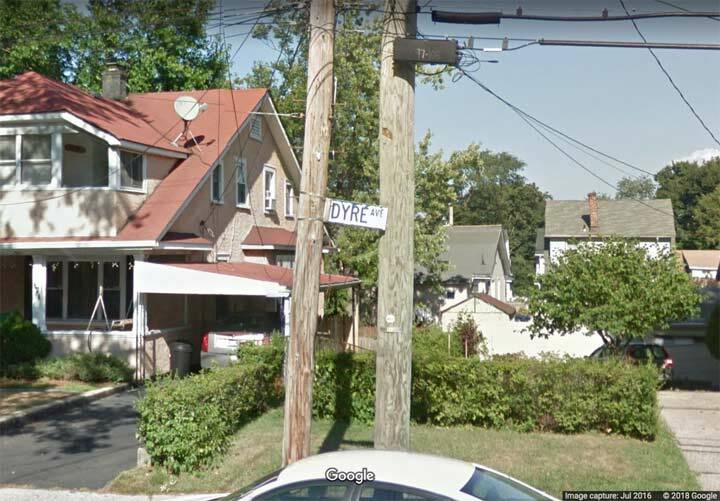 In this section of the Bronx, Eastchester, a long-ago developer gave some of the side streets names like Light, Dark and Lustre. Many NE Bronx avenues carry the names of long-ago mayors. William Dyre was NYC mayor from 1680-81; in those days, NYC consisted of the lower part of Manhattan to just about City Hall, which would not be built for over a century. 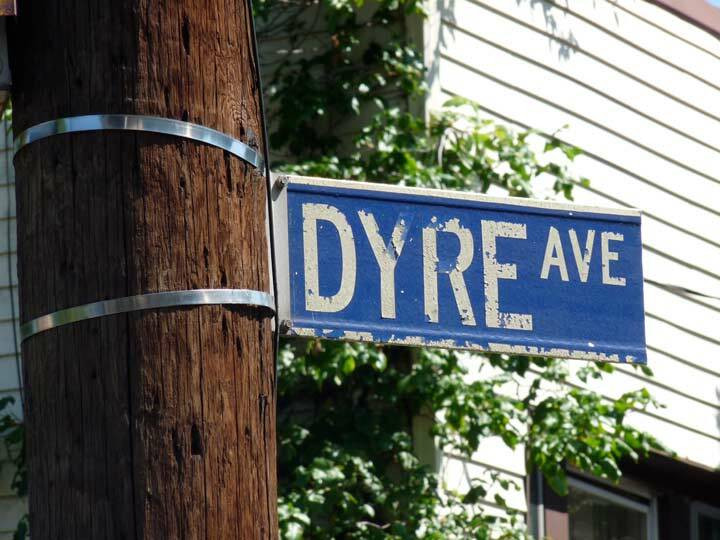 It’s not to be confused with Manhattan’s Dyer Avenue, a West Side feeder road for the Lincoln Tunnel. Technically these streetlamp fixtures were known as the 3737 series. They were first manufactured in the 1950s and were mostly used for illumination on side streets. I call them “crescent moons” for their shape. 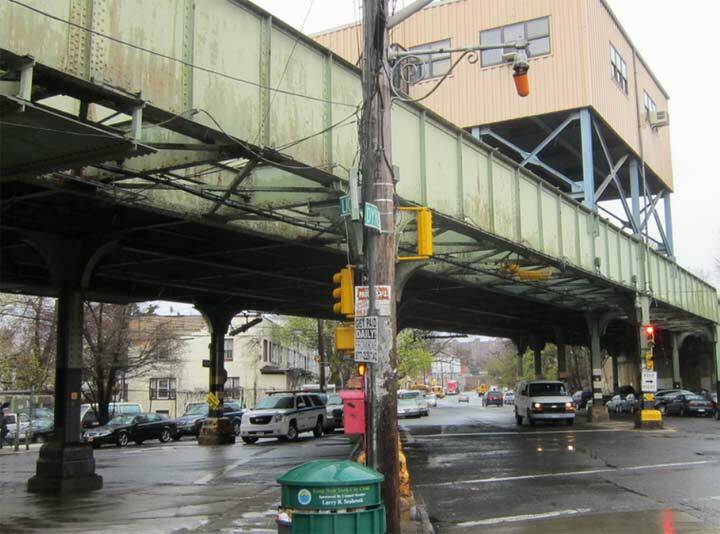 They also frequently turned up under elevated train overpasses. While most were removed in the 1960s, a pair can still be found at this remote outpost, though neither has had a working incandescent bulb in ages. 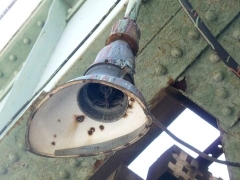 This old-school scrolled fire alarm lamp indicator mast can also be found at Dyre and Light. The city stopped maintaining these about a decade ago, but hasn’t bothered to remove them. Two sides of the same blue and white Bronx sign at the SE corner of Dyre and Light. This was one of the few remaining blue Bronx signs left in place, from the days when NYC street signs were color-coded by borough (approximately 1964-1984). looking at the latest Street View, this sign may have disappeared. 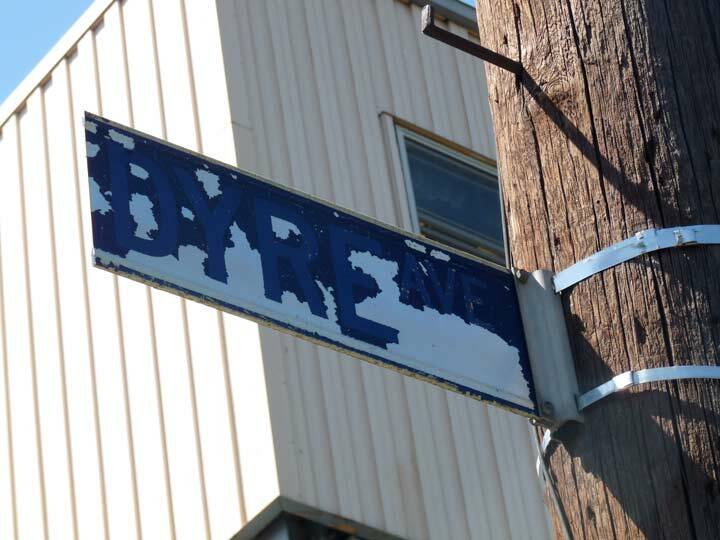 This faded Dyre Avenue sign is at the Bronx-Mount Vernon border, where Dyre becomes South 5th Avenue. I believe this may be another blue Bronx sign but it’s so sunbleached that it’s hard to tell. 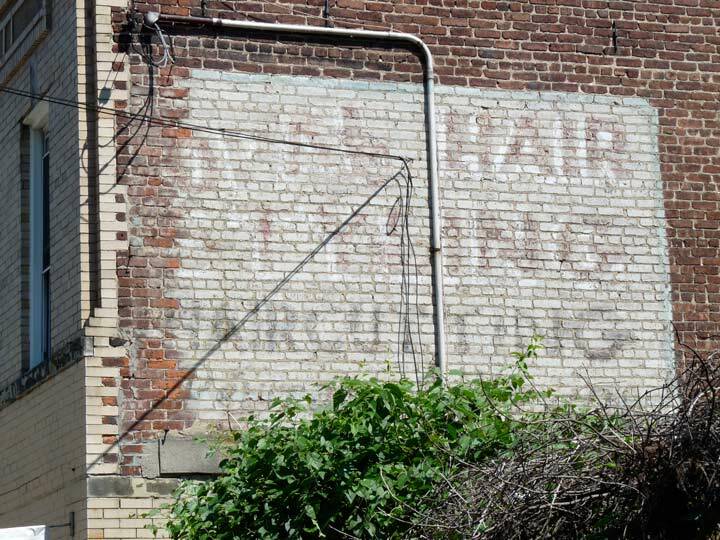 These two painted signs, on Dyre and Light respectively, are still in place but have faded even more or have been graffitied over. One is for a long-lost bar, the other for a long-lost haircutter. A “swash” Coca-Cola sign on a pizzeria, going back to the early 1980s at least. While here, I can’t not mention Bronx’ own Little Red Schoolhouse, PS 15, is at 4010 Dyre Avenue, near the Bronx-Westchester line. 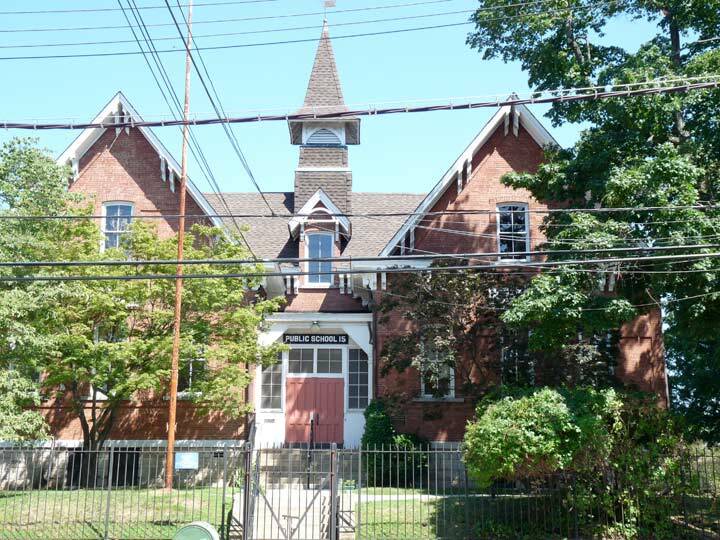 The architectural gem was built in 1877, designed by architect Simon Williams and was originally a school in the town of Eastchester in Westchester County before its “capture” by NYC in 1895. It now serves as a community center. 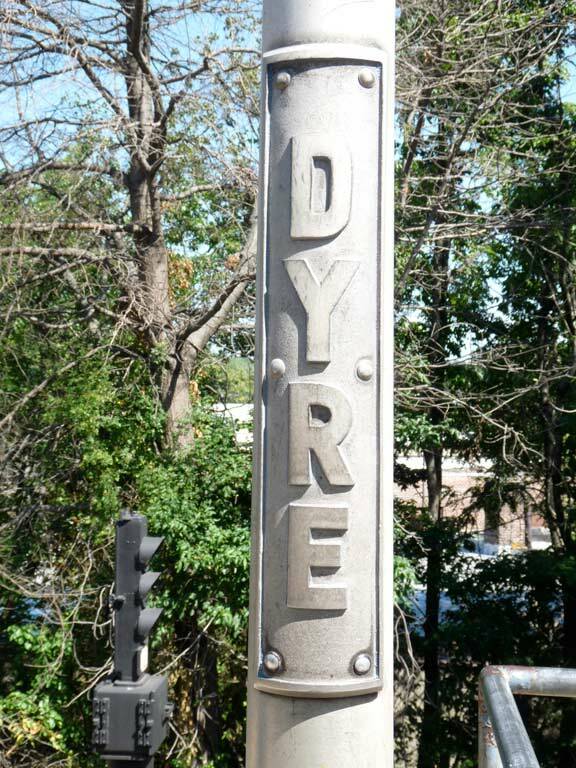 In 2011, the Dyre Avenue station had several ancient gems, like this track indicator light. 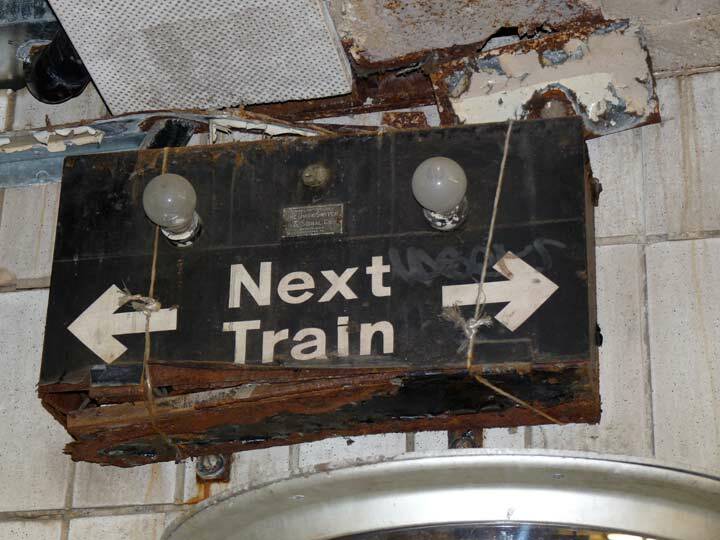 Beginning in the early 2000s, these began to be supplanted by “countdown clocks” that showed when and what the next train would be. Well into the 2010s, Dyre Avenue kept its 50-year-old set of incandescent platform lamps, consisting of twins supporting clusters of bulbs in each luminaire. 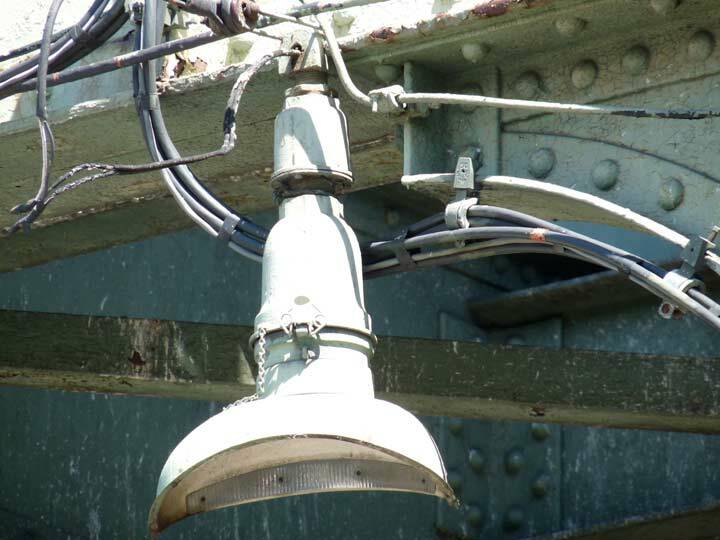 These have all been replaced by T-shaped high intensity twin platform lamps. At first glance, I thought it was an old Queens blue-on-white sign. The sun would not have changed the color from white to blue would it? I believe I once ate at that Pizza shop. Back in the early 90’s, a friend was a motorman on the 5 train from Dyre Av. Once a month or so, I would drive over from NJ and ride with him; all cabs were small. One rainy Saturday afternoon, between trips he had lunch so we walked over to this Pizzeria and had a few slices. I was a Bronx resident in that era and I confirm this nickname. It was called that because there were only two cars on each train. Thank You. What great memories! My grandparents were one of the few African Americans to move on south 9 avenue. Which is on the boarder of Mount Vernon and The Bronx. Around the 1950s. Kingsbridge Road was across the street and we were on the Mount Vernon side. I remember when Kingsbridge Road before the city pave the streets. My grandfather would cuss up a storm becouse when the weather was bad , driving was horrible. 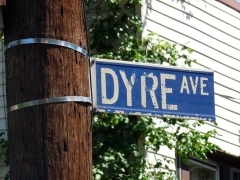 The Dyre ave. train was always crowded. People even back then, late 50’s early 60’s were cranking and rude on the nmberer 5 train becouse it was survival of the fittest. Especially when the # 5 train passed by 149 ST. Where Hearns Department store use to be. Oh man, That was one wicked, wicked, curve. No Dinky was not the word. Remeber this was way, way, before the Saints invented AIR CONDITION on the trains!!!! And when they were added,guess what line would be at least one of the last to have such luxury? I am not a historian, just sharing my memories from my eyes as a little girl. 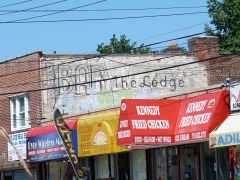 My Dad and Uncle’s Butcher Shop (John and Frank’s Meat Market) was where that ‘The Lodge Bar’ sign was – in the store with the blue awning. We lived right around the corner on Light St. Many great memories there. We left the area in 1971, and the the store stayed open ’til the summer or ’74. We closed it after my Dad (Frank) suffered a stroke and was unable to work any longer. Did you go to Nativity? 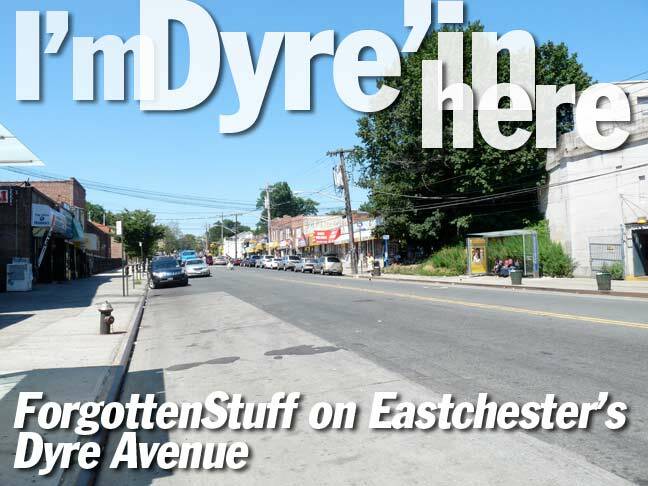 I lived on Dyre across from the “el” in the apartment building. From 1960 until 1970? Saw the ‘chicken delite’ go up where there used to be a community garden, the taxi, the fountain shoppe(bookee), the deli, bakery, insurance store, pharmacy. 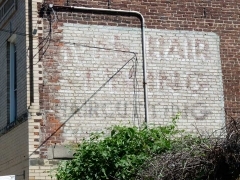 Other side was butcher shop, pigglywiggly, think hardware, bar, my grandfathers barbershop. And of course the school. Tuccis and the rectory and convent and Hickeys bar next to rectory. Hi John, you & I were in the same class, 7th & 8th grades at Nativity. I’m Mary Canich, also lived on Light St, the corner building. My mom always went to your dad & uncle’s butcher! So many years ago, but seems like yesterday! My family owned the Dry Cleaner from 61 to 07. I attended kindergarten at PS15 in 1971 when I was 5 years old! I remember so many things about that sweet little school, especially my teacher, Mrs. Swanson. It was the coziest, sweetest little school. I think I loved it so much because it had so much old-fashioned character. Thank you for bringing back some precious memories for me!!! 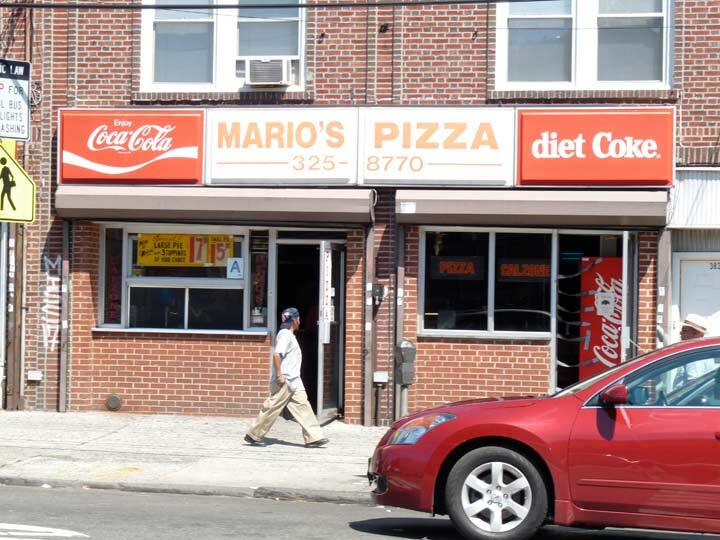 And Mario’s Pizza was my favorite hangout from the mid 70’s to the early 80’s. Can anyone tell me if there happens to be any free parking on the street around this subway stop – Dyre Avenue/ 233rd Street. I’m looking to take this subway into Manhattan on Wednesday. Remember the Rex grocery store? You & I were in the same class in Nativity, 7th & 8th grades. Wow! I lived on Light St. Mary Canich. We went to your dad & uncle’s butcher shop all the time!